Michael Jackson may have never have performed in the People's Republic of China, but on October 23, 1987, he made a seven hour visit to Chinese soil. Crossing at the Gongbei Customs office from Hong Kong, it was the task of 23-year-old tour guide Liu Guangzhi to look after the superstar. "He was fascinated by the rice fields, water buffalo and ducks in the pond," says Liu, who first took him to Yongmo Village. "He was very nice. At that time he wasn't surrounded by a large group of bodyguards. Many villagers recognized him and asked for photographs and signatures. He looked with great interest at a baby wrapped in swaddling cloth, said 'hi' to children and took photos with them." They had lunch at the Zhongshan Hot Spring Resort. A large group of Americans saw him there and recognized him, and took photos with him excitedly. "Michael Jackson was a vegetarian at the time," says Liu. "So we prepared vegetarian food for him. Other than that, it seemed that he wasn’t very picky about food." After lunch they went to Cuiheng Village, Nanlang Town, the birthplace of the 'Father of Modern China,' Dr. Sun Yat-sen.
"He asked me to tell him stories about Dr. Sun. He seemed to admire him a lot," says Liu. One photograph of Dr. Sun attracted Jackson’s attention in particular. "He inquired about the origin and design of Dr. Sun’s Chinese tunic suit. It was said that he had a Chinese tunic made to order in Hong Kong and brought it back to the US." The seven-hour-visit was soon over. Before he left, Jackson told Liu that, "the scenery of Zhongshan is similar to Switzerland. Everything is green." "He left us with good memories," says Liu. "He was very quiet but also very friendly and would greet the children and take pictures with them. 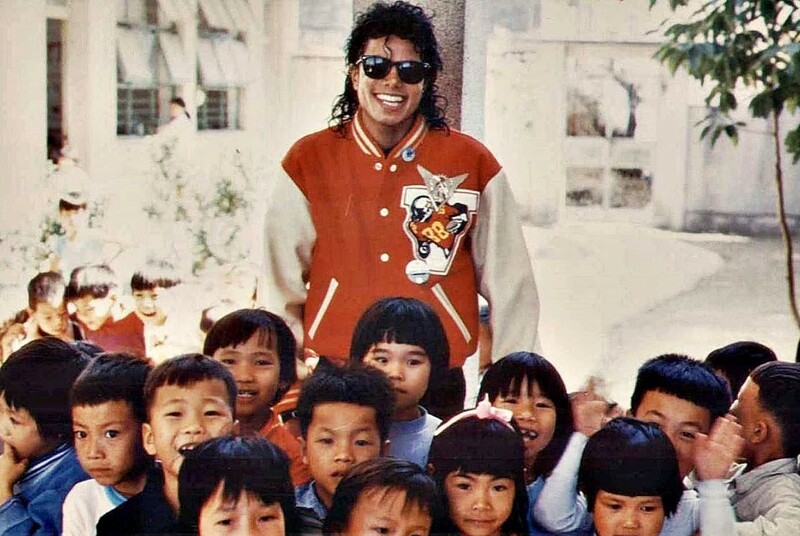 One of the photos even appears in Jackson’s autobiography, under which reads the caption: "When I saw the Chinese kids, I couldn’t resist them."